Erin, from Small Orchard Lifestyle Blog, is married to Buckle manager, Jake, and is mama to 20-month-old, Zoey. Today, she’s demonstrating how to get the most out of one dress by using layers to repurpose it for multiple occasions. Hi friends, Erin here! Spring is here and dress season is upon us! This time of year is always jam-packed with holidays and events. Soon, we’ll all be running to our closets looking for the perfect piece to wear. So what’s the best way to get the most out of your summer dresses? I’m so excited to share a few simple steps on how to take one dress and style it three different ways for completely different looks! By simply switching up a few key layering pieces, you can easily take a fun and funky daytime look to a perfect classy evening out or a simple summer night in! Start by choosing a dress with a classic fit. 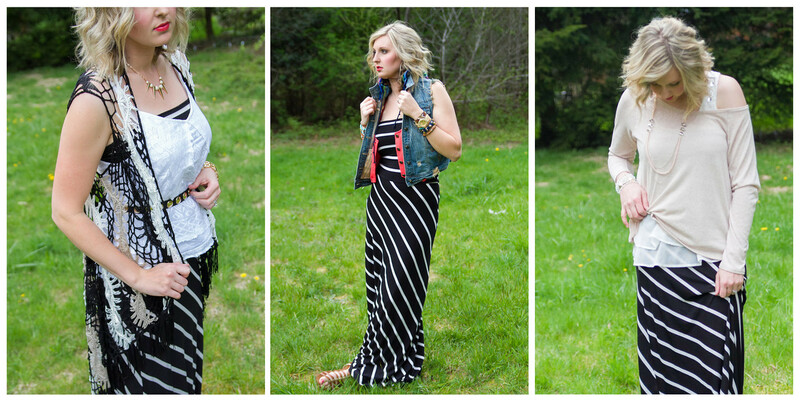 Maxi dresses are a great choice. They’re comfortable, easy to wear, and should be a staple in every woman’s wardrobe! Choosing something semi-neutral will allow you to mix and match it with more pieces, even some you might already have in your closet. Next, add your first layer. Choose a structured piece that will help form your look, or add an accessory (like a skinny belt) to give it some shape! This is a great opportunity to build interest by including a bright pop of color or embellishments. Choose a top layer that ties your dress and first layer together. This piece should showcase your best features of your outfit! If your base layer has embellishments, add a light sweater with an off-the-shoulder neckline. Play with the lengths of your layers – don’t be afraid to throw a longer cardigan over your summer tanks. Experiment with different fabrics and textures that speak to the occasion you are dressing for! Finally, pile on the accessories! 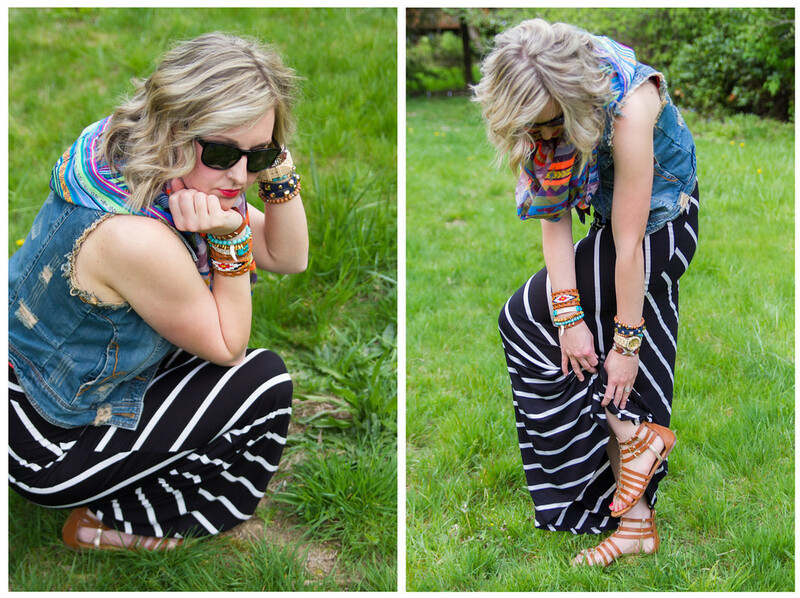 Think scarves, necklaces, fashion flips, and more! Well-chosen accessories complete your outfit and really top off the different looks. Stack multicolored bracelets to bring out your bright layers. Try mixing and matching metals to tie together the color palette. Add sunglasses or a bag to top it all off! It’s all about the details! My favorite looks to wear are ones with tons of visual interest. Find pieces that catch your eye and show off the best features of that piece! Don’t be afraid to put something together that you may have not tried before. With these few steps, you can breathe a new life into a simple dress or get more mileage out of your old favorites! Here’s to hoping you enjoy this sunny season and begin looking at dresses in a whole new way! A big thanks to Jake (Manager) and Danielle (Visual Manager) from the Buckle store in Tacoma, Washington, for their help with the outfits in this post. Give Jake or Danielle a call at (253) 473-9748 for a free fitting, or check our store locator for a Buckle store near you! hahaha i always do that, i think every one does that, and if the dress is pretty just like your then it would be great. Thanks Erin and your daughter is very cute.